Whenever I’m in a thrift store and I see a box or bin full of old sewing patterns, I can’t help but paw through them. Usually, I find regrettable patterns for 1980s-era garb, but every now and again, I find wonderful vintage sewing patterns that would be perfectly upcycled into framed wall art – perfect for craft room decor or sewing room decor. I went through the vintage sewing patterns until I had accumulated the best of the bunch (in my opinion)- all of them from the ‘50s,’60s, and one from the early ‘70s. Yes, I’ve previously played around with old sewing patterns…but that’s when I simply craved the patterned tissue paper within the envelopes. But this time…THIS TIME I wanted the envelopes themselves. Why? To make framed wall art, of course! Simple, inexpensive wall art for a walk-in closet…the room of a child who just loves fashion …a sewing room…even a powder room. This post contains affiliate links for your crafting convenience. So, I of course nabbed some cheap-o picture frames from the thrift store, too- deciding that 8″ x 10″ would be a good size for what I had in mind. Hurray for thrift store frames! 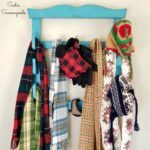 With my vintage sewing patterns and thrifted picture frames in hand, I went through my stash of vintage bed sheets and pulled out a few that had a “Mod” fashion vibe. I was counting on these pairing up nicely with the old sewing patterns to become framed wall art for a craft room or sewing room. I deconstructed a picture frame, setting aside the glass pane to wash and the actual frame to paint. Then I trimmed down the cardboard backing (just a smidge on each side) and cut out a rectangle of bed sheet fabric larger than the cardboard, which I then ironed. I carefully folded the vintage bed sheet fabric over on one side and sponged on some watered-down Mod Podge to fuse the fabric to the cardboard. I did that on all four sides, pulling the fabric taut as I went along. Happy to see that Mod Podge was the right choice. While the Mod Podge dried, I used my iron again and carefully used it on each vintage sewing pattern envelope. I knew they wouldn’t go totally smooth, but it gently pressed and flattened them. Then, I used more watered-down Mod Podge to attach the pattern envelope to my fabric-covered cardboard pieces. 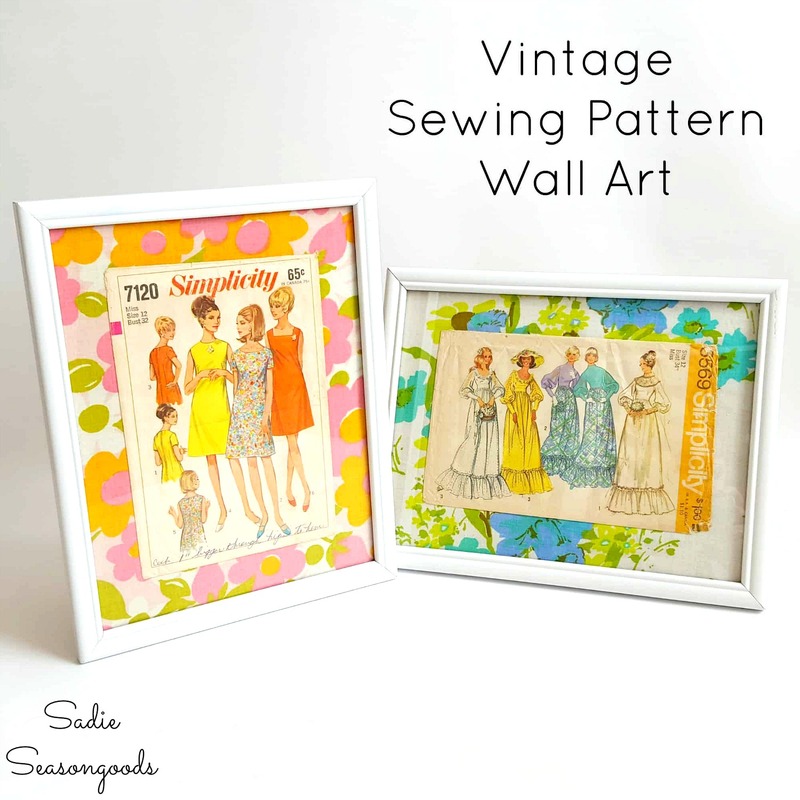 Framed Wall Art for the Craft Room with Vintage Sewing Patterns – Revealed! When all was said and done- including spray-painting my frames in a glossy white- I assembled my DIY framed wall art with vintage sewing patterns under the original glass panes (which I washed!). Aren’t they stunning? And there’s zero waste since I can recycle the pattern tissue paper in a project (such as wrapping holiday gifts). 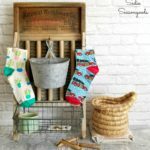 I just love a net-zero project, and making framed wall art from old sewing patterns and vintage fabric is a perfect example of that. 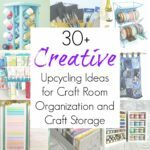 Love upcycling and repurposing craft projects as much as I do? Please check out my entire collection of ideas here for even more inspiration! I love this idea. I have an apron pattern from the 40’s I bought at a Goodwill several years back. Its fragile but i would like to display it. I have to do this and find a couple more to hang on my love. You are very clever. I buy vintage sheets to and make cute blouses. I would love to know what you do with the pattern tissue paper. I’ve posted two different projects with them: http://www.sadieseasongoods.com/tag/sewing-pattern-craft/ . I also use the tissue to wrap purchases from my Etsy shop! These are so cute, Sarah! I have a pile of patterns from the ’60s & ’70s from my mom’s collection. I’ll never sew with them but they would make really great art. Thanks for yet another awesome thrift store project. 🙂 And Happy Craft Month! Thanks, Stephanie! AND YES, hurray for Craft Month!! I really like your creative use of fashion history! Sarah, this is such a great idea!! You really scored big on these patterns! The fabric you used to match the picture is perfect!! I have some old patterns I bought at a yard sale that are the cutest, now I know what to do with them!! Oh, I absolutely love this idea! And I also have many many vintage patterns. What a nice use for them! Great choices with the complementary fabrics, too. Thank you so much- it was fun to match them up with what I had! Woah, that’s a brilliant idea! I have quite a few old patterns I inherited form my nan and mu mum, all this sort of style. I kept them out of sentimentality but to make art from them – how lovely. This came at the perfect time. I was gifted 2 vintage boxes of patterns from a patient and we are in the process of moving into our dream home in 5 weeks where I will have a sewing studio. These will be perfect for decorating my new space! Thanks for sharing and for the idea! You always have the cutest ideas! I wish I had your creativity. Thanks so much for sharing at Throwback Thursday! Sadie, I love your framed patterns! I actually did a close variation 4 yrs ago, for my sister. Found 2 toddler/child patterns from her birth yr, and framed them w/ a background matte of pattern pieces. I created some little caption strips which said, “A sister is SEW dear”. Anyhoo, I have a ton of pretty 50s, 60s, & 70s patterns, and I’m inspired by ya to frame some more of them. You rock! Blessings, Julie H.
Thank you so, so much, Julie!! Your version sounds wonderful, too! I love this idea, it is so colorful and unique. The wedding dress pattern is the one I used for my wedding dress — over 40 years ago! I still have it and can’t wait to frame it like yours — Thanks for this idea! This is such a cute idea! Love your creativeness. As I took a closer look at the patterns, I realized I actually made the long dress, that really dates me doesn’t it? Lol I made one for my first prom n made another for a singing group I was in from school. It was a cute dress. Thanks for sharing. Thanks, Dee! Unfortunately both framed pieces have already sold…but I will DEFINITELY be keeping my eye out for that one again! Sarah, These turned out so cute! Love the material you used! This is a wonderful way to display old patterns! Pinned to share. Thanks for linking up for Snickerdoodle Sunday! These are so darn cute ~ love how you paired them with the vintage sheets! I have patterns my grandmother used back in thee 30s and 40s so I am going to do this. I have also copied them, shrunk them and printed on card stock about 2×3 punched hole and used twine to make package gift cards. These are always received with joy. What a great idea, Jimmy!! This is truly a darling idea. And, it brings back memories of when my mom would be at her sewing machine. Oh this is just too cute! 🙂 Love this look! What a clever idea for sewing room decor! Just playing with you. But really…the 80s were so fashionable. Thanks for joining Thoughts of home on Thursday. Your patterns make cute artwork! What a great way to decorate a sewing or craft room. I have so many of these vintage pattern packets. I made a mistake on my name. Please don’t publish my email!!!!! Hi, Teresa- unfortunately someone already requested the patterns!! But I have some similar ones for sale in my Etsy shop! https://www.etsy.com/shop/SadieSeasongoods (I also deleted your previous comment- hopefully that solves the problem!). I just love this idea! Thanks for sharing at the Inspiration Spotlight party! Pinned & Shared. Hope to see you again soon. So glad you were able to join Roses of Inspiration this week! Hugs! Thank you so much for linking this post up on #HomeMattersParty last week. It was picked as one of our feature posts. You can check it out at http://adventuresfrugalmom.com/home-matters-linky-party-77/. While you are there make sure to grab the I was Featured button for your sidebar so you can brag a little. Thanks for linking up and hope to see you link up again. Saw this on the #HomeMattersParty. This is such a great idea I want to go to thrift store right now. How absolutely cool is this! I have my mothers sewing kit and there may be a few old patterns left in it. She loved to sew and would make a dress for me in the morning and I would wear it that night. I’m pretty sure she made a couple for me from pattern #7120. This brought back so many memories, thank you! Sarah, this is so cute and clever! I can’t wait to try it out with some vintage patterns that I picked up many moons ago. Thanks again for sharing at the Celebrate Your Story! Link Party. I love this cute art. What a wonderful way for us “kids” who grew up in the 50s and 60s to repurpose our old patterns. Or, this is cute for anyone who sews. Especially if you have patterns you’ll never use again. I admire your creativity. Keep your wonderful blog coming! Thank you for the sweetest words, Barbara- they came just when I needed to hear them! Our mom has tons of boxes of vintage sewing patterns. These are the perfect use for them! What a fun way to dress up a craft room. Thanks! Hello!! I wanted to let you know that your post has been chosen as a Feature post for the Welcome Home Wednesdays Link Party! Stop by tomorrow morning and see your post linked up and grab your Feature Button too! Thank you so much, Lisa- will do! Good Morning!! I wanted to stop by and let you know that your post has been selected as a Feature Post for the Welcome Home Wednesdays Link Party!! Stop by this morning to see your post linked up and to grab your “Featured” button too!! Hi! I just looked at your pattern wall art — and was totally blown away! The pattern you show with the wedding dress is the one I used to make my own wedding dress in 1973! I do not have the pattern, the dress, or even the husband any more, but life is good and that sure brought back some memories! Hahaha, what a great story- I love it!! Very pretty and artistic and I love using and not wasting things! Thanks for linking up with Funtastic Friday! Great idea for a sewing room! What an amazing idea to use these in a frame and the vintage fabric as a background is giving them really the last touch! So cool and I love these for a walk in closet! I’m happy you shared them at Sweet Inspiration!! Love, love, love! I have some old patterns of my late grandmother’s. I am going to frame them just like this!! I have been holding onto a collection of vintage items, including an old apron, sewing patterns, old pair of Wiss pinking shears inn their original box, packets of free sewing needles from life insurance companies in Florida in the 1950’s. I hope to get these in a shadow box frame, and hang with my framed patterns in my laundry/sewing room- where my 30-year old Kenmore machine proudly rests on top of my great-grandmother’s antique Singer cabinet. Thank you!!!! And those will be lovely! I have many sewing patterns from the 60’s. They are items that I sewed then. This is a wonderful way to display them. I’ll be decorating my studio with them. Thanks for a terrific idea! You are so very welcome, Debbie! I just finished a couple wall pegs made from old wooden thread spools of different sizes. These would go with that whole look so perfectly. Thank you for sharing!